Here are your two practice videos. Enjoy! Reminder for all Finger Kung Fu Exercises: Don’t just “get through” these or skip them because you “can already do them”. Follow along for a few minutes every day, then bookmark where you are in your practice log and return to the spot in your next practice session. If you feel “bored” you are not doing them correctly and are missing out on one of the fastest ways to improve your technique and playing – the point is to slow down and feel the nuances of your posture and resulting improvements in tone and timing. Focus on select details as I point them out in the videos or choose your own problem areas to focus on. Why? Here, going slower gets you to your goal faster. Treat them like a bass meditation and accelerate your learning. 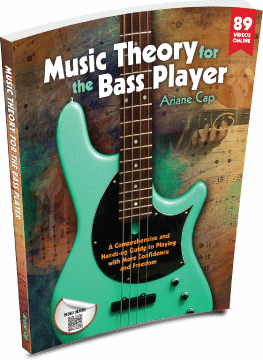 These videos are directly taken from “Music Theory for the Bass Player – The Course”. Each unit contains 7 TABs, each TAB contains several videos, PDFs, back ground tracks and written summaries and tips.